The Italian Greyhound is a slender and miniature dog breed who has a slightly curved back. Graceful and elegant, with a high-stepping and free gait, it is able to run at top speed using a double-suspension gallop. 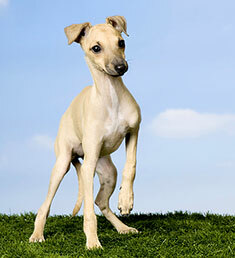 Although Italian Greyhounds are a devoted and affectionate dog breed, play around small children should be supervised. The Italian Greyhound originated in Italy. Italian Greyhounds range from 12 inches to 15 inches. Italian Greyhounds range from 6 to 10 pounds. Italian Greyhounds are typically gray, red, black, fawn, cream or blue and may have white markings. Italian Greyhounds have a short and glossy coat that requires periodic brushing. The Italian Greyhound is a devoted and affectionate dog breed who makes a good companion. 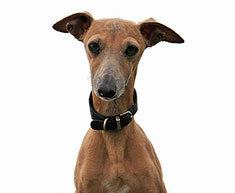 Headstrong and stubborn, the Italian Greyhound requires a consistent and firm leader. The Italian Greyhound is susceptible to epilepsy, broken legs, slipped kneecaps, periodontal problems and Progressive Retinal Atrophy. The expected life span of the Italian Greyhound is 12-15 years. Italian Greyhounds will do well in apartments as long as they get plenty of exercise. This dog breed is fairly active indoors and is sensitive to cold weather making it a good apartment dog. The Italian Greyhound is in the Toy group. Find Italian Greyhound Puppies with our Free Breeder search!